Initiated by the Goethe Institute Paris and ENSAPC and in the framework of the exhibition LES STATUES MEURENT AUSSI. SUR LES TRACES DE L’HISTOIRE COLONIALE FRANÇAISE, Fabian Saul, editor-in-chief of the Flaneur Magazine, offered an interdisciplinary workshop on urban spaces at the Palais de la Porte Dorée. The workshop was open to students from ENSAPC, Ecole nationale supérieure d’architecture de Versailles and Ecole nationale supérieure de paysage de Versailles. During this intensive two-day workshop, participants examined the Boulevard Périphérique, its hidden layers and its relationship with the Palais, taking a collaborative and interdisciplinary approach and transformed one of the working spaces of the Palais de la Porte Dorée into a temporary editorial office. The participants were introduced to the cultural techniques of “flaneuring” and the narrative strategies of psychogeography. 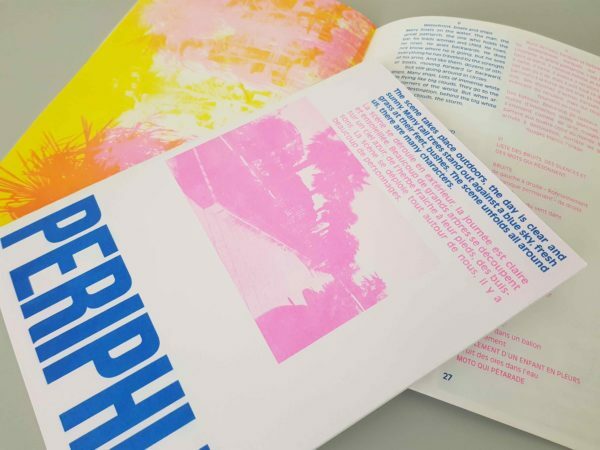 Resulting from this research, the magazine PERIPHLE was created, moving the exhibition into the urban space and providing a critical meta-text about the Palais de la Porte Dorée itself. The magazine is available at Goethe Institute Paris and the International relations Office of ENSAPC.